From Valentine’s Day promotions to beautiful, Instagram-worthy menu items, the fast food industry is always looking for new ways to compete for our hearts and wallets. Alas, there are some parts of the industry where the status quo cannot be changed. For example, despite new breakfast offerings from Taco Bell and other fast food restaurants, McDonald’s continues to monopolize the most important meal of the day with their famous McMuffin — they hold 75% of the share of visit during breakfast — when compared with direct competitors. Other times of the day, however, are much more volatile. From cravings to insomnia, there are many motives for dipping tacos into ranch dressing at 2am. Because late-night snacking is usually driven by ‘want’ versus ‘need’, there is a lot more uncertainty around why people make their late-night munchie choices, making it vulnerable for a takeover. Taco Bell is already a strong contender in the late-night category — they account for nearly 20% of all late-night Fast Food visits and see 13% of their daily visitors during their late-night hours. Already having a strong hold on late-night, they partnered with Lyft to get more people in the door at Taco Bell to satisfy those late-night cravings. Taco Bell took the age-old saying, “if you build it they will come” one step further and physically brought late-night diners to their locations in Newport, CA. 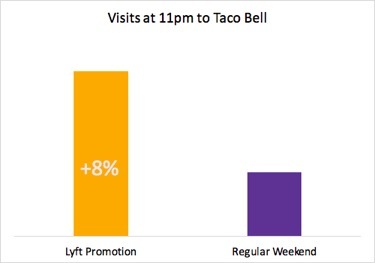 Overall the “lyft” to Taco Bell locations in the Newport, CA area rose by a mere 3% during weekend late-night. But, look closely at specific time frames and you can see a sizable lift in visitation. During the 9pm and 11pm hour, Taco Bell saw a larger spike in visitation than the average of previous weekends. In fact, during the 11pm hour, Taco Bell saw an 8% increase in visitors when compared to the average of previous 11pm weekend hours. Where can Taco Bell go from here? 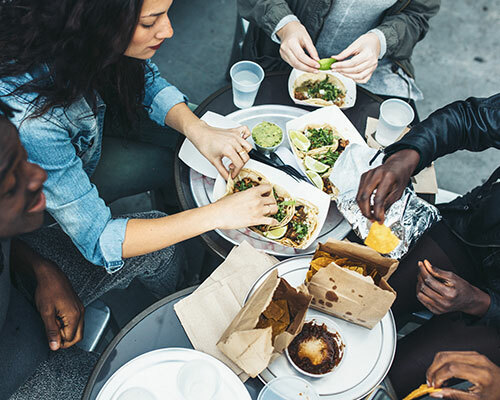 Working with a location intelligence company like PlaceIQ can help Taco Bell gain deeper insights on who their late-night diners are — specifically those who contributed to that 11pm spike. Where do they shop? Where else do they eat? Taco Bell can use this information to locate similar customers in other key markets, and then smartly execute their next late-night promotion. To learn more about how you can use location to understand, reach and engage your consumers, please reach out for more information.